The deposition of intralumenal thrombus in intracranial aneurysms adds a risk of thrombo-embolism over and above that posed by mass effect and rupture. In addition to biochemical factors, hemodynamic factors that are governed by lumenal geometry and blood flow rates likely play an important role in the thrombus formation and deposition process. 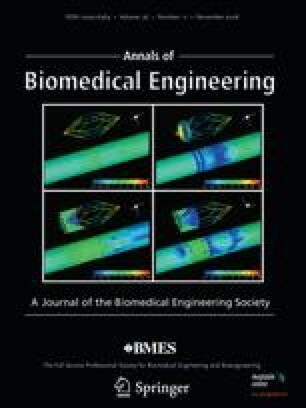 In this study, patient-specific computational fluid dynamics (CFD) models of blood flow were constructed from MRA data for three patients who had fusiform basilar aneurysms that were thrombus free and then proceeded to develop intralumenal thrombus. In order to determine whether features of the flow fields could suggest which regions had an elevated potential for thrombus deposition, the flow was modeled in the baseline, thrombus-free geometries. Pulsatile flow simulations were carried out using patient-specific inlet flow conditions measured with MR velocimetry. Newtonian and non-Newtonian blood behavior was considered. A strong similarity was found between the intra-aneurysmal regions with CFD-predicted slow, recirculating flows and the regions of thrombus deposition observed in vivo in the follow-up MR studies. In two cases with larger aneurysms, the agreement between the low velocity zones and clotted-off regions improved when non-Newtonian blood behavior was taken into account. A similarity was also found between the calculated low shear stress regions and the regions that were later observed to clot. Rayz, V. L., L. Boussel, G. Acevedo-Bolton, et al. Numerical simulations of flow in cerebral aneurysms: comparison of CFD results and in vivo MRI measurements. J. Biomech. Eng. 130, 2008. doi: 10.1115/1.2970056.